I’ve banged on about eyelid primer before, but I’m still on that hobby horse. I just really want to share what a massive difference using an eyelid primer makes to creating a beautifully made-up eye. You can be using the best eyeshadow in the world, applied with the best eyeshadow brushes, but if you haven’t used an eyelid primer, well, you might be buggered really. Simple! Here’s some photographic evidence on the left. I’ve used an inexpensive eyeshadow palette from Maybelline. 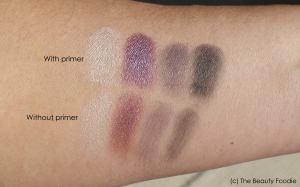 I swiped the brush through the eyeshadow and applied it to my arm in two different places: One swipe on the part of my arm where I had applied eyelid primer and another swipe where there was no primer… Ummm, on he non-primed part of my arm I did THREE swipes of eyeshadow to get that effect! See the difference?! Would you try and paint a pink wall in your home without using a primer? No of course you wouldn’t! I make my point! Please ladies, I totally recommend including an eyelid primer part in your makeup routine (that is, when you wear eyeshadow). Oh, and while you are at it, please do your brows (sorry, I couldn’t resist, I’m relentless). 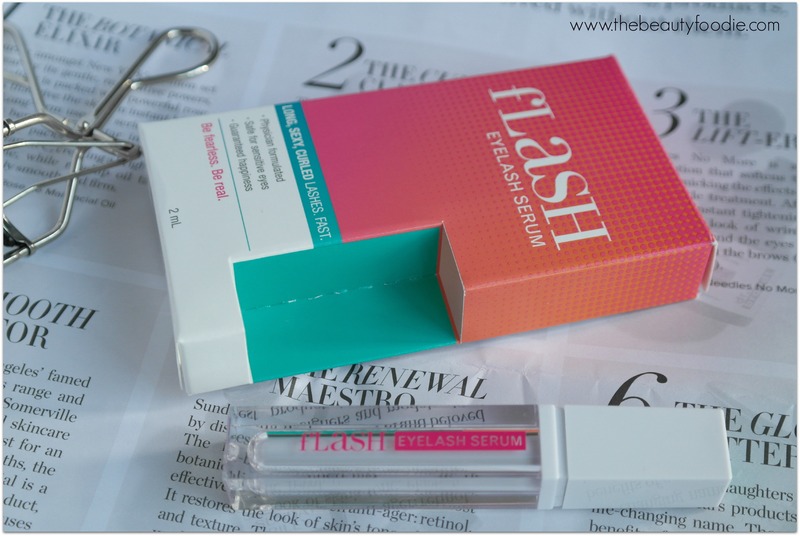 How does an eye primer work? 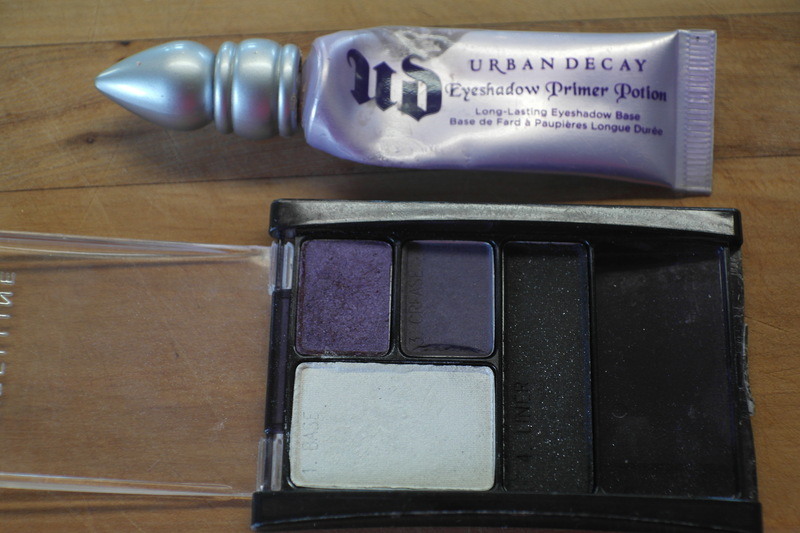 Eyelid primers are a base coat, that you apply before eyeshadow. Eye primer (which is a different product entirely to foundation primer) often contains silicone and works by creating a base for eyeshadow – so it has something to stick to! Many primers dry to an invisible finish so you can’t even see that you’ve got it on but by using a primer, your eyeshadows will be more vibrant, won’t fade and won’t crease or oil up during the day. If, like me, you suffer from oily eyelids and find your eyeshadow doesn’t last, or it creases, or fades then you definitely need to get an eyelid primer. It makes such a difference. I promise! By the way, on the part of my arm where I applied eyelid primer – it took all day for the eyeshadow to come off and it only came off in the shower when I blatantly rubbed it with shower gel and a facecloth. The other part (no eyelid primer used), I rubbed that away easily with my finger. So if I’ve convinced you, here’s some eyelid primers I recommend: If you have really oily eyelids, go straight to one of the following: Urban Decay’s Primer Potion, Too Faced Shadow Insurance or Smashbox Photo Finish Lid Primer. I’ve raved about the Urban Decay Primer Potion in this blog post. You can buy this from BeautyBay (free postage to NZ!). The good news is, for those of you without oily lids Australis (good inexpensive Aussie brand) have recently released an eye primer in NZ – it’s only $13 – and I totally give this the thumbs up (not quite industrial strength for me – but it’s still a good product!). You can get Australis at Farmers or selected pharmacies. Still not sure? If you are skeptical and you are in NZ head to your nearest $2 Shop (or 1,2,3 or D-City) and start with Jordana’s eyeprimer ($4.50). It’s thick and quite cakey, but it does a reasonable job! I’ve heard NYX and Elf have good options (but, usual story, you can’t buy these in NZ, but you can get them on Trade Me!). So, who uses an eye primer? Please let me know if there’s a brand you use that I need to try!